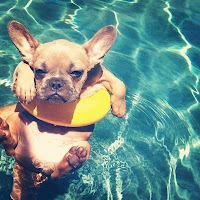 Have you ever heard the phrase, "dog days of summer?" I have, but I wasn't really sure what was meant by it. So since research is part of my job, I looked up the meaning. It just so happens it has an interesting origin. In ancient times different groups of people in different parts of the world drew images in the sky by "connecting the dots" of stars (reminds me of a Henry and Mudge book. See my dog connection). The Chinese saw different images than the Native Americans, who of course saw something different than the Europeans. These star pictures became to be known as the constellations and were mapped out by our European ancestors. Our ancestors saw images of bears (Ursa Major and Ursa Minor, twins (Gemini), a bull (Taurus), and others, including dogs (Canis Major and Canis Minor). 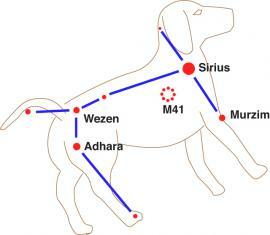 Sirius is the brightest of the stars in Canis Major, which also happens to be the brightest star in the night sky. In fact, it is so bright that the ancient Romans thought that the earth received heat from it. During the summer, Sirius rises and sets with the sun, so the Romans believed that the heat of Sirius combined with the heat of the sun, thereby creating a stretch of hot and sultry weather. They named the period between July 3 and August 11, the "dog days of summer." Although it is certainly the warmest period of the summer, the heat is not due to the added radiation from a far-away star, no matter how bright it is. Nope, the heat of summer is a direct result of the earth's tilt. If the "dog days of summer" ever decide to show up this year, still remains to be seen. If they do, I know that my dog will want to be chilling in the pool to escape the heat just like the rest of us. He'd probably enjoy laying in the grass looking up at the night sky to search for the constellations with me too. Sounds like fun, right?